Located on Bristol’s well-known Harbour side, the Aquarium showcases native and tropical marine and freshwater creatures from around the world in naturally themed habitats, all tailored to inspire a deeper understanding and appreciation of the world underwater. 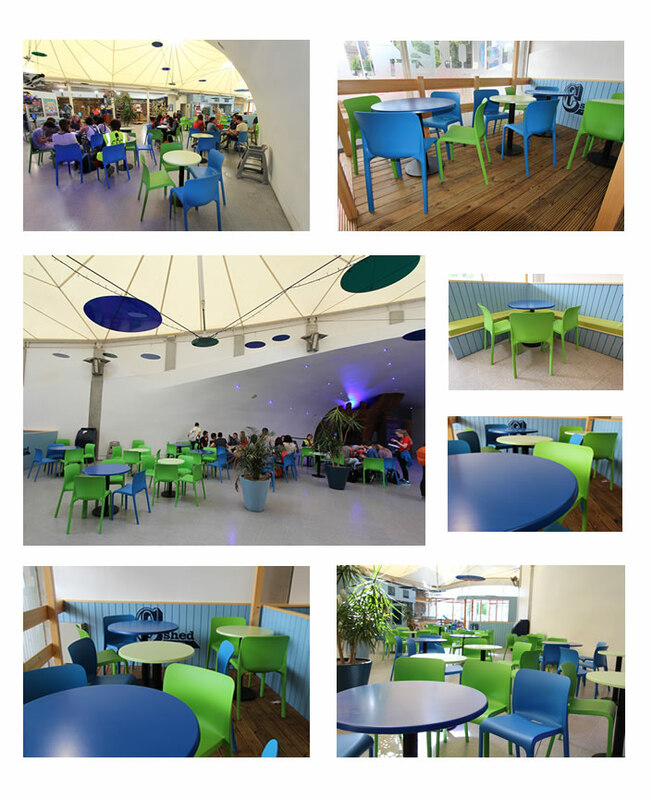 Bristol Aquarium approached Café Reality in order to tailor and supply a bright, durable dining solution for their main ‘C Shed’ café area. With the Aquarium being popular with visiting families, schools and colleges the traffic would be high so it was fundamental to deliver a solution that could withstand the demands of this type of environment. In addition to this, our client specified that the colours must replicate those that are featured within their illustrious ‘Coral Seas Display’; Blue and Green. From the very first conversation it was clear durability was going to be the difference between success and failure of this particular project. 23 tables and 78 chairs were deemed adequate to shape this high traffic dining facility. A simple but functional table base was specified (B1 option) to accompany the werzalit tops, due to its timeless design, durable construction (Weighs 15kg) and its black powder coated frame, which makes the base highly resistant to knocks and scratches. Pop chairs were nominated as the preferred seating solution. The Pop chair is a contemporary air moulded chair, designed for commercial, work place and educational environments. It’s strong, lightweight, durable frame and bold colour finishes a lent itself seamlessly to this project enhancing the overall aesthetic of the café and aquarium. The team were extremely happy with their dining facility and the furniture received, promising to use Café Reality for any future projects they may have in the pipeline. We would like to take this opportunity to wish the Bristol Aquarium team all the best for the future.